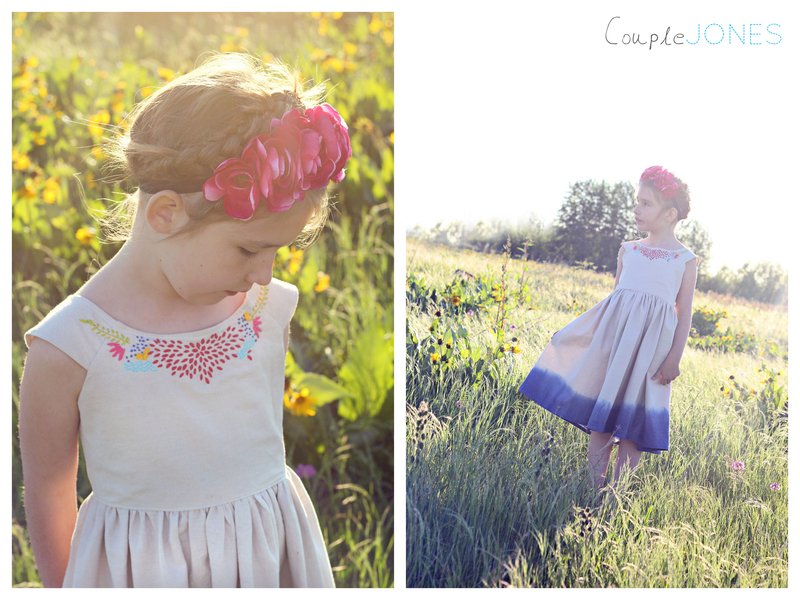 Best of Summer Sewing with Cailamade! 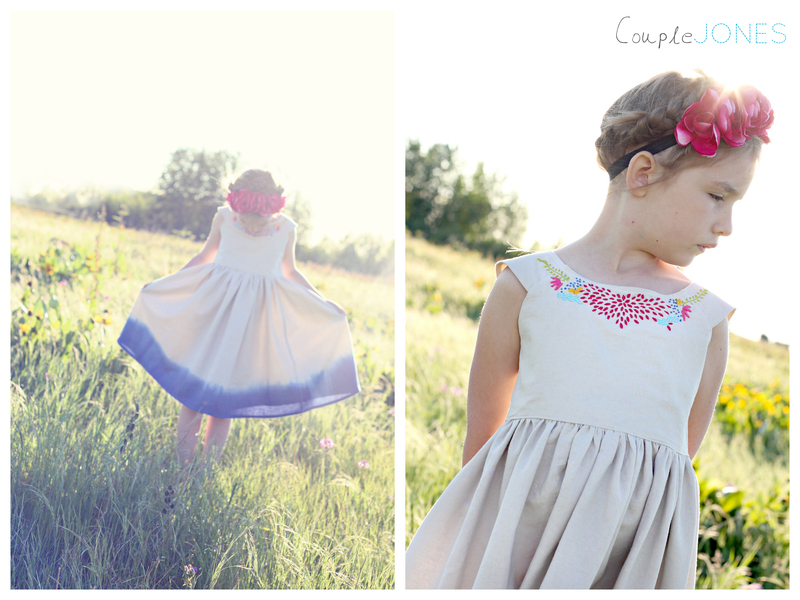 Today I am sharing my favorite summer pattern in a review on Cailamade! I was so excited to be asked to participate in Caila’s “Best of Summer” series! It is the first time I’ve been able to join in on the fun in a series and the group of ladies who are featured last week and this week on Caila’s blog are amazingly talented, I am so honored to be a part of it all. 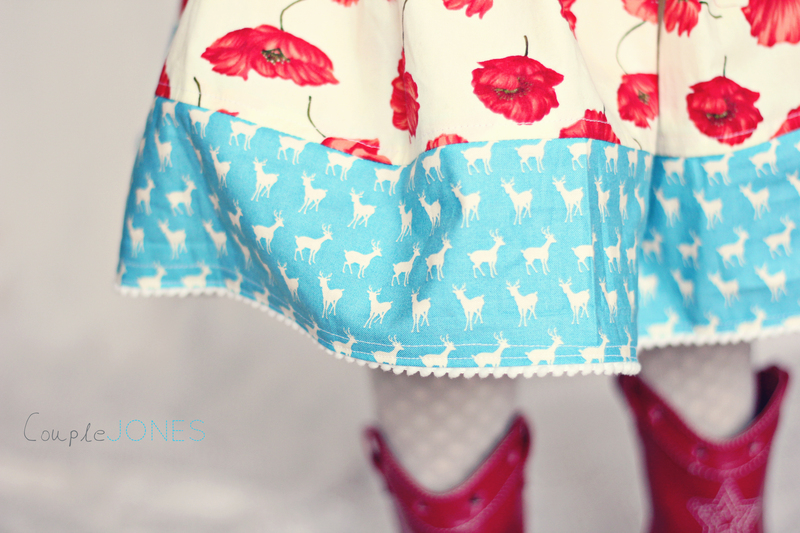 To see more of my favorite dress pattern and how I added my own personal touches to a (SERIOUSLY!!) 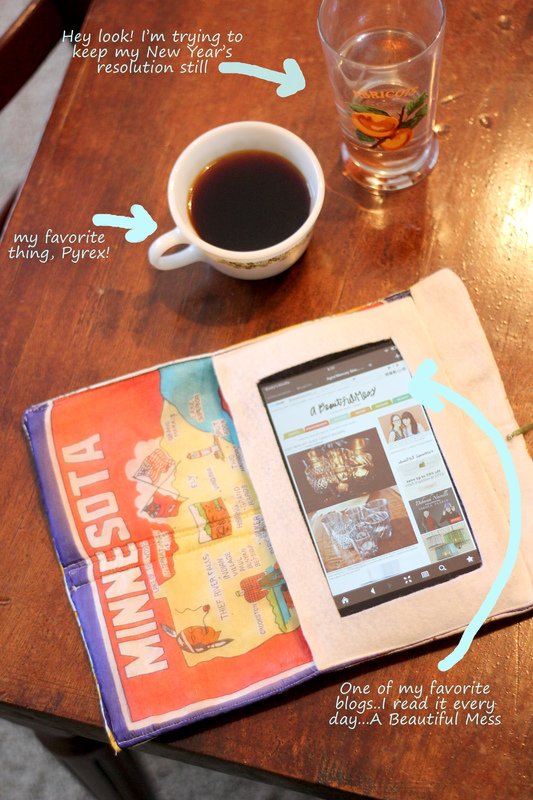 SIMPLE pattern, click the “Best of Summer” widget below and head over to Cailamade! As I was sewing, I was thinking about how many people tell me that they would love to learn to sew but don’t think they could ever do something like this. But you CAN! I promise. 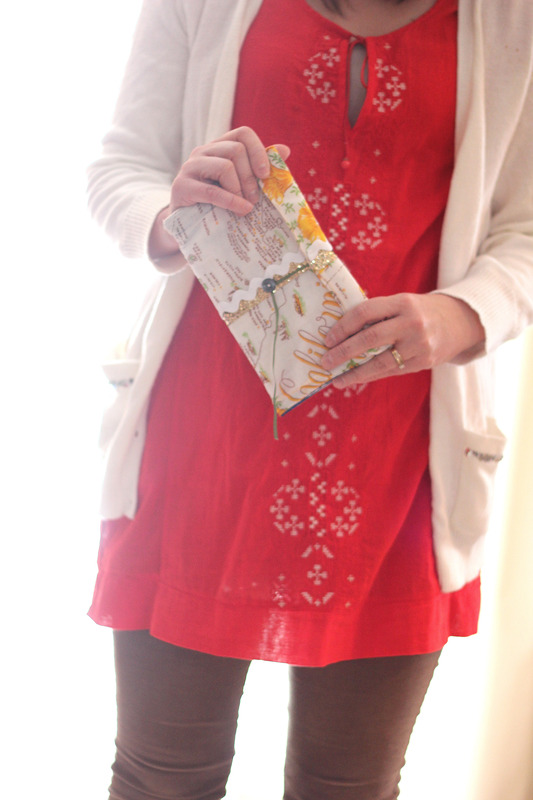 The best thing about sewing is that you can make a super easy piece look like something from Anthropologie just by adding your own little details here and there. Choose an easy pattern. The pattern that I used for the dress above is from Simplicity’s New Look 6205. It has simple lines which meant the skill level wasn’t very high at all. I simplified it even more for myself by changing the pleated skirt to a gathered skirt. Don’t be fooled by the design on the pattern packaging. 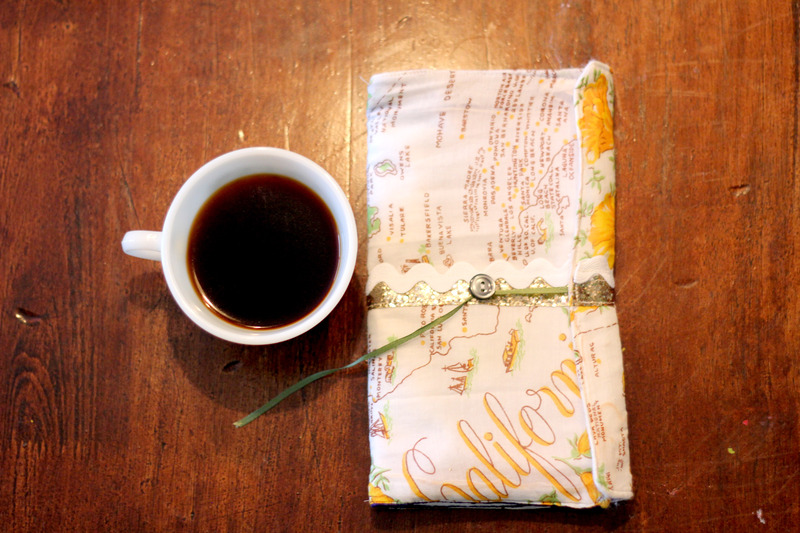 If you look at the packaging of the pattern I used (see HERE) it is vastly different from the look I created. When I look for a pattern, I only look at the lines of the piece. I fell in love with this dress because of the neckline – it looks so vintage to me. Begin with solid fabric. When you are a beginning sewer, choose fabric without a print. A piece can go from simple to complicated very quickly if you are having to worry about matching up a print when seaming fabric pieces together. I can’t tell you how many times I’ve started sewing pieces together, only to realize that on one side the flowers were pointed up and on the other side the flowers were pointed down. Arg. Begin with cotton, or some other fabric that doesn’t have a lot of stretch and give. 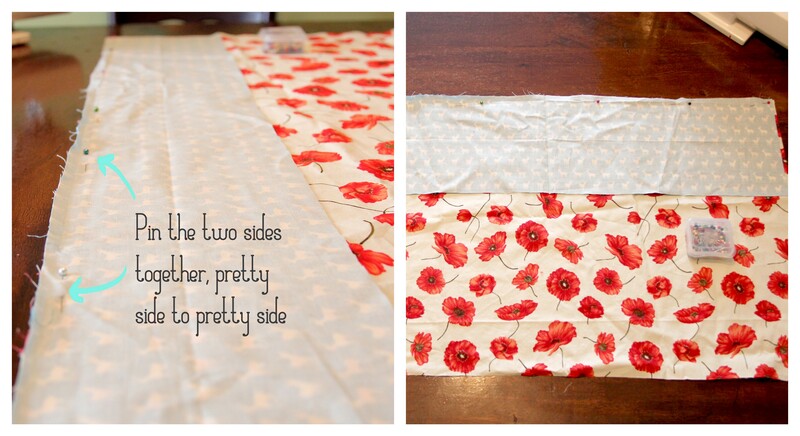 It’s way easier to sew a nice solid piece of fabric. I used a linen-look fabric for my dress. Once you get basics mastered, you can move onto more complicated fabric, but stay simple to begin with. Ask questions of those nice, fabric store employees. I bought my Linen Look fabric from Joanns’ and before I had my fabric cut, I asked the employee what the laundry directions were for the fabric. Personally, I don’t buy fabric that can’t be washed in a machine for my kids. It’s not practical. You might be ok with handwash, either way you should know before you buy what the care requirements are for the fabric. Read the WHOLE pattern before you do anything. There is so much information and it can look overwhelming but read it all before you cut and you will be glad you did! It’s not rocket science reading, just plug on through it and you will have a better plan of how to go about starting the project. Own a Seam Ripper. This little guy will be your best friend! 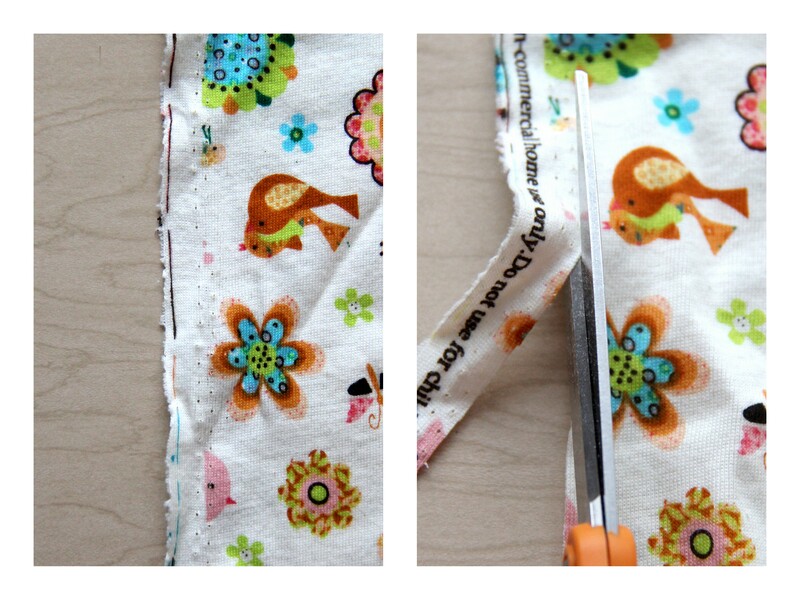 You can rip out a seam without damaging the fabric and start over! The BEST. 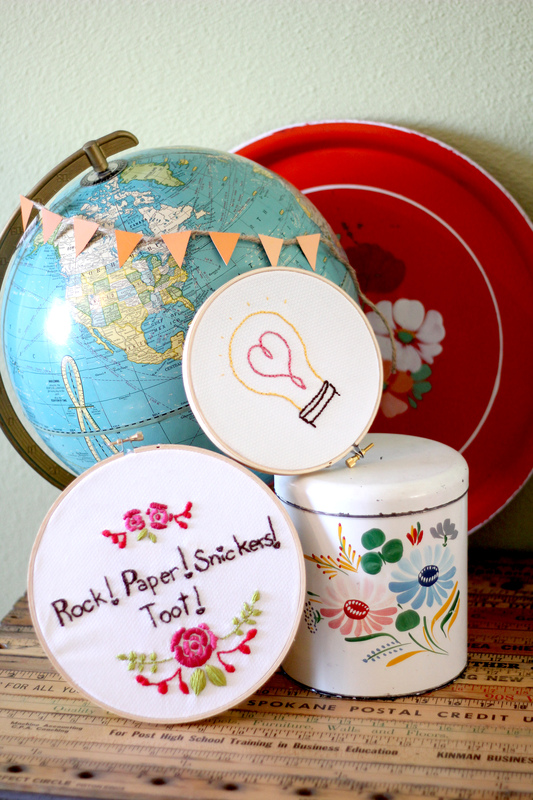 Any of the ladies participating in “Best of Summer Sewing” will tell you they keep theirs close at hand! 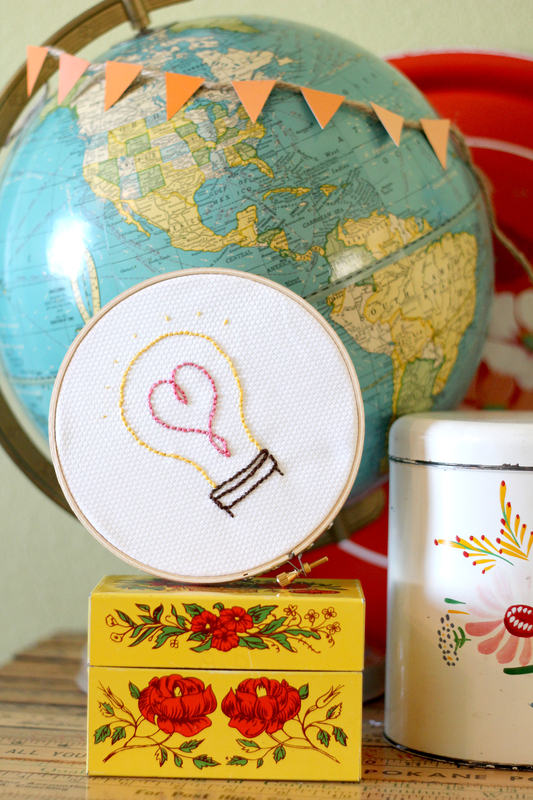 I hope you feel inspired to try sewing if you’ve never tried it before! The schedule for Caila’s series is below and every day has featured a review of a great pattern that you can try for yourself. Browse through the posts and you will find something you would love to try! These ladies are WONDERFUL resources for all levels of sewers! 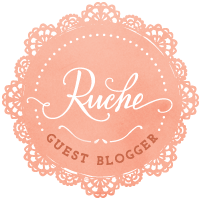 If you’d like to follow us, you can do so on Bloglovin’ and we also have a Facebook page. Have you visited this great site yet? Mommypage.com is a wonderful resource for moms! There are contests, crafts, recipes and lots of helpful articles. Come by today and visit and see my interview. 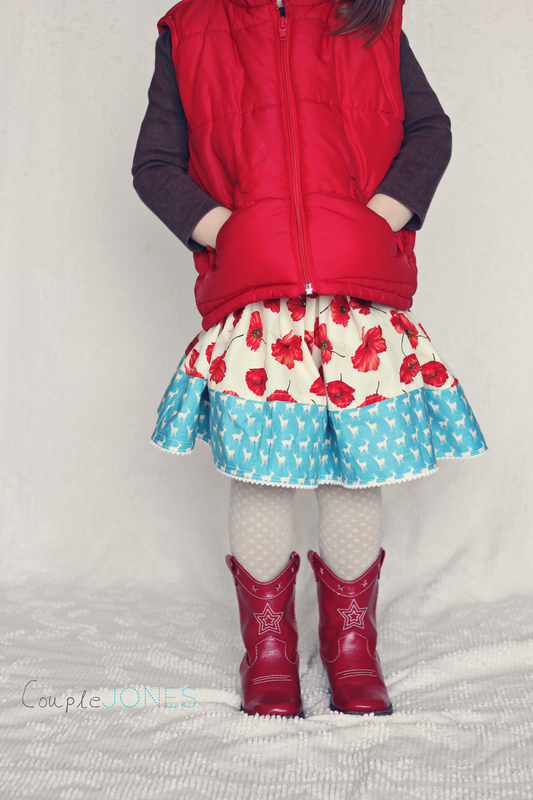 Thank you to all the ladies at MommyPage for contacting us and asking to feature Emily! 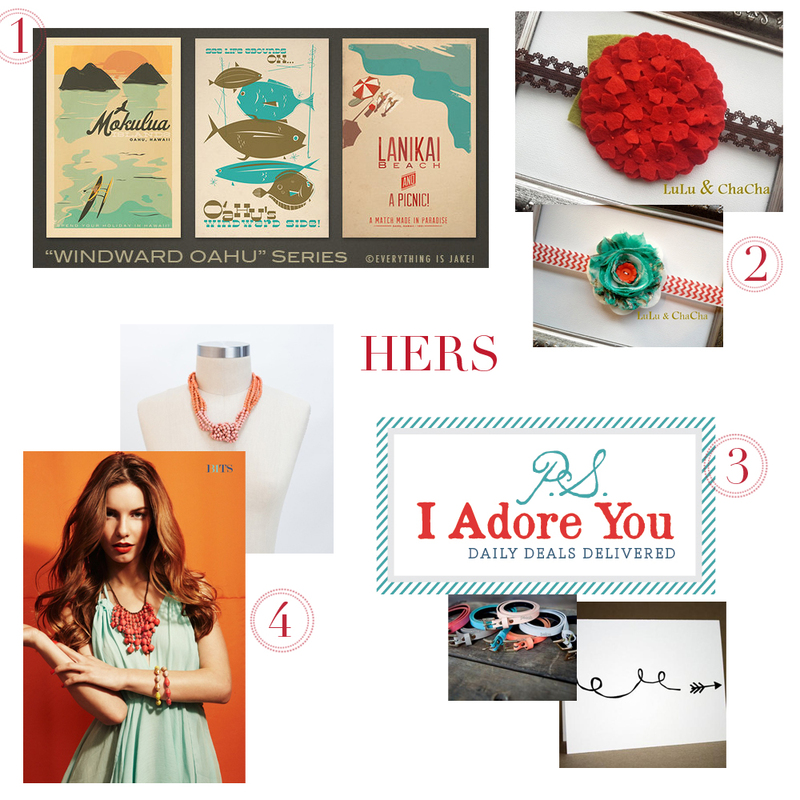 Encourage to Inspire, a collaboration with CailaMade! 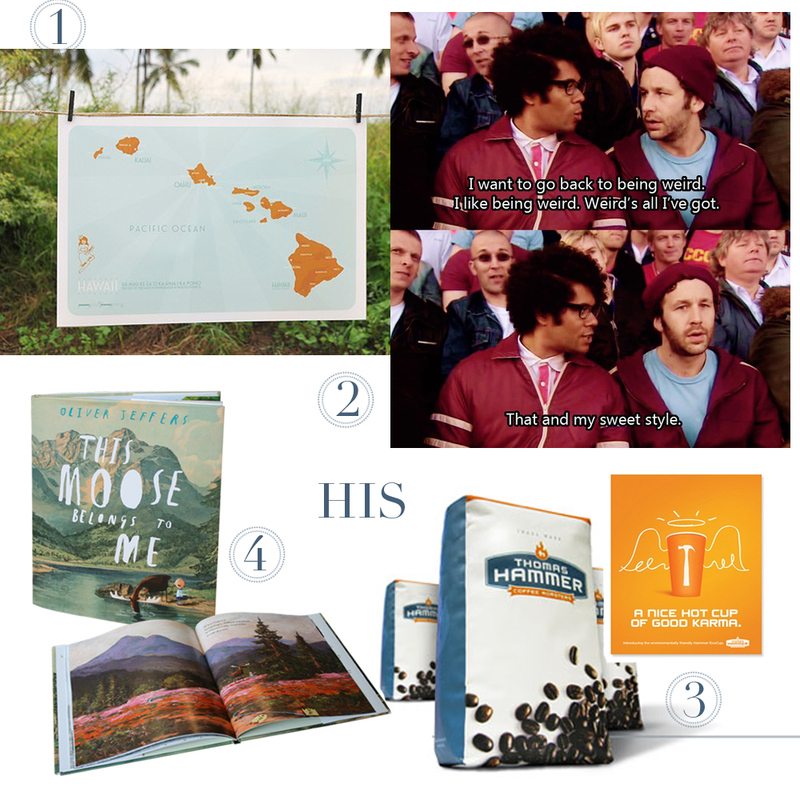 When I started blogging two months ago, I wrote to my college friend Caila to tell her that I had finally decided to follow her encouraging Instagram hints that I should share some of my projects online. Caila also happens to be an amazing blogger (you should follow her! Cailamade! ) and so I shared my heart with her a bit too. I shared that if I write, it is very important to me that I write a clear picture of real life. I am NO Martha Stewart, not anywhere close. I have 3 crazy kids and more piles of laundry than I know what to do with. I think it’s so easy to create this glossy, perfect picture online of something that life never is. I am real in person, can’t lie to save my life, SUPER bad at being cool. I want to be that person here too. And those things are extremely important to Caila too. My sweet friend is SO good at sharing her beautiful talents in a way that is encouraging and real. 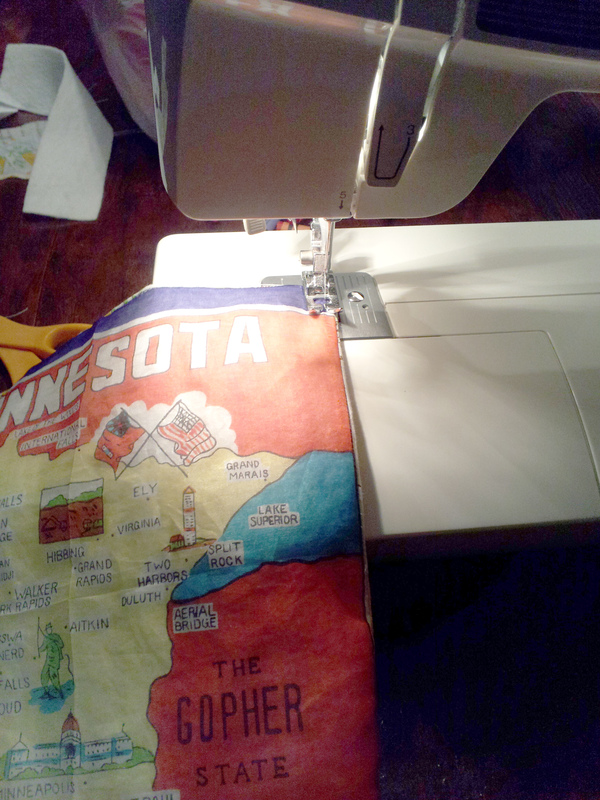 Her sewing skills are far above mine, but I always feel encouraged by her projects and the new things she tries. And I always walk away feeling inspired to try something of my own. We talked about inspiration and how we want to encourage our readers, and how we hope that encouragement leads them to feel inspired to create in their own way. We want them to be encouraged by reading about an average girl who attempted a new project. The end result is never perfect (more so in my case than Caila’s, ha!) but that doesn’t matter one bit. The joy is in creating something unique to who you are. Whether that means sewing, painting, writing, hosting a girls’ night, etc. It is our thought that when you feel encouraged, you are more confident in who you were created to be and will be inspired to pursue your own unique goals and dreams. Isn’t it so amazing that we have the power to encourage others? To illustrate this idea, Caila and I chose one of each other’s posts that inspired a project we created in our own way. 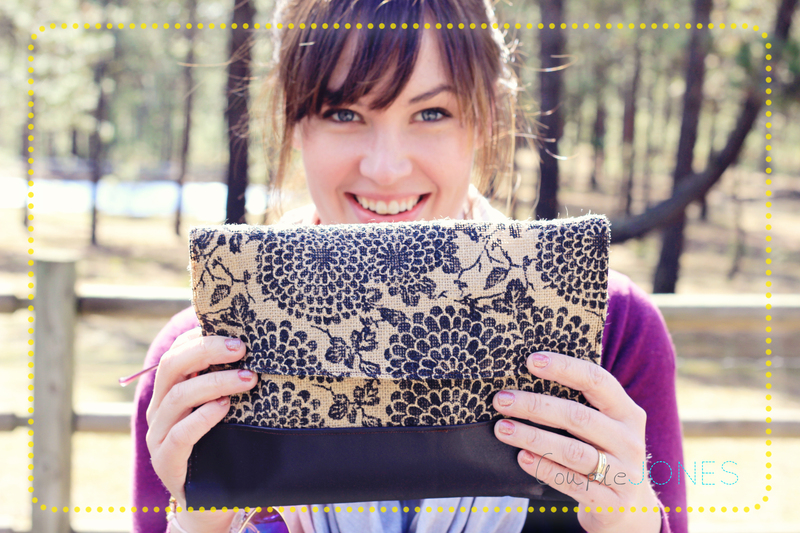 I was extremely inspired by the beautiful clutches that Caila made over the holidays. She also worked with leather to make leather card holders. 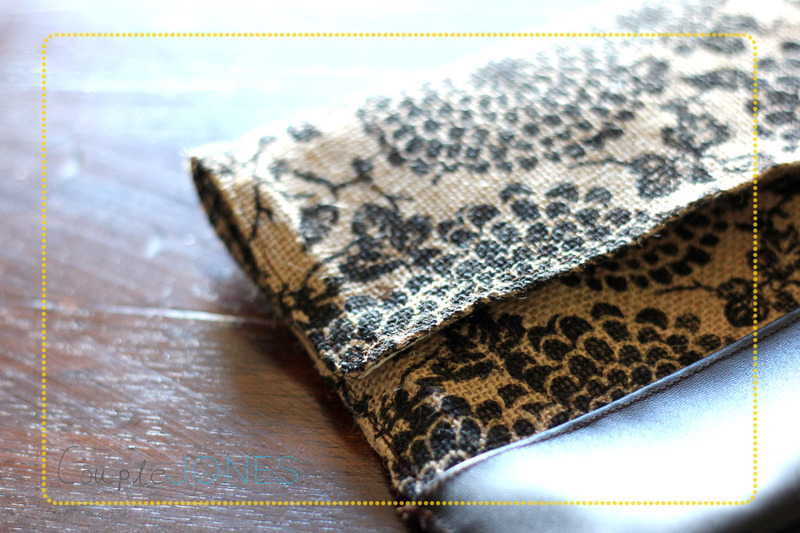 These posts got my head spinning with possibilities and made me want to try to make a clutch AND to work with leather – two things that I have never attempted before! I wouldn’t have had the confidence to give it a try if I wouldn’t have seen someone else take it on with great results. I worked with printed burlap from Joann’s that I fell in love with. Not your standard fabric for a clutch but that’s how I roll. With this project, I finally had the motivation (read –> BRAVERY) I needed to check out the leather factory in town. I learned a lot from my little adventure – 1. They don’t cut leather in yards like fabric, which means the piece I initially wanted to buy was WAAAY out of my price range. 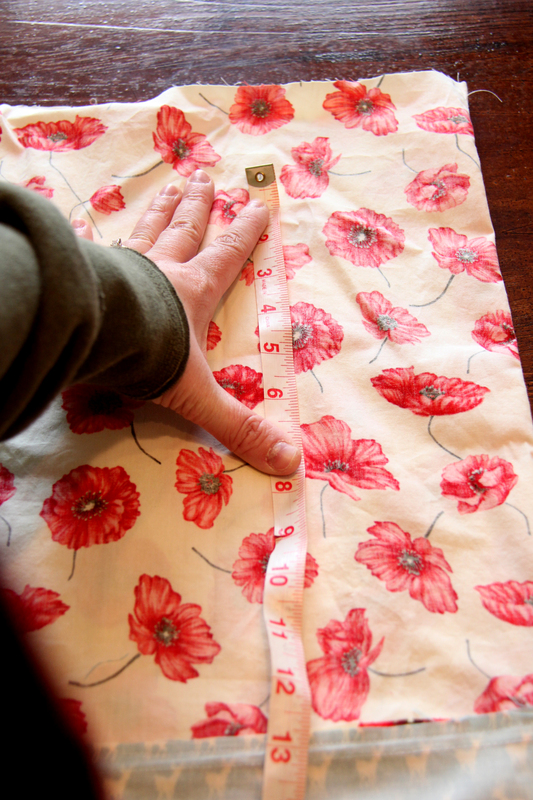 And I was NOT the cool kid in the shop when I asked about yardage – MY bad for being the newbie. :) BUT! 2. After some hunting, and not so awesome customer service, I figured out that they had a “Discontinued” table where I found a great piece that matched my fabric for $10! Sweet! As a result of the encouragement I got from reading about Caila’s successes, now I feel comfortable in a leather store – oh yeah, not a rookie here anymore – Sweet. 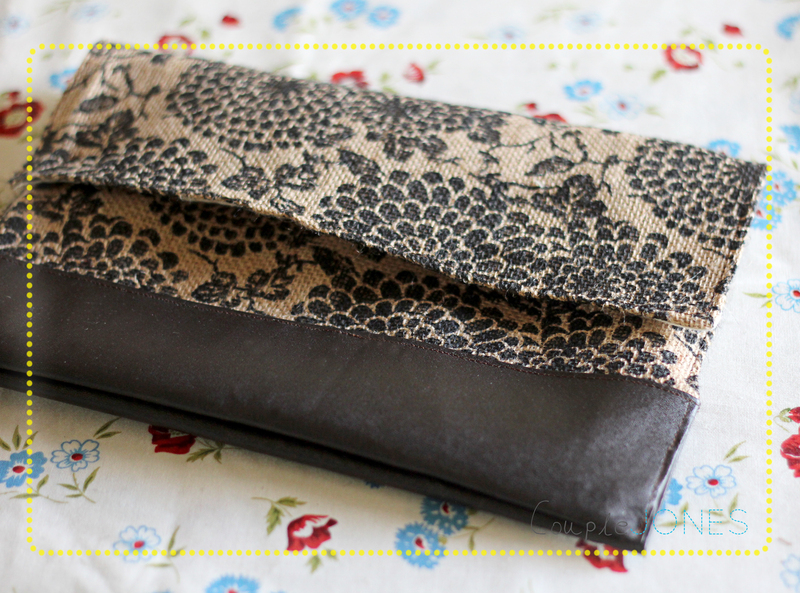 I also know more about the general layout of a purse/clutch and now the possibilities are ENDLESS. Woohoo! Thank you CAILA! Caila was inspired by our project to raise money for Compassion International with our Space Kid print. She created something AMAZING. Read her post HERE to find out just how unintentionally identical our character ended up being to her sweet son, Hudson. You can also follow her on Cailamade, Pinterest, Facebook, Twitter, and she is @cailamade in Instagram. She is such an encouraging person to be connected with, you will really benefit from following her on some or all of her social media connects! Caila’s blog is beautiful and she is such an uplifting person. As we were working on our projects, I was so blessed by connecting with Caila. We discovered, on accident, that we were both in need of some encouragement and finding out that someone else was feeling the same way I was helped my heart so much. We accidentally proved our own thesis. Everyone needs encouragement. Everyone needs to hear that they are doing a good job. That they are special. That they are just who they were created to be. And if we take just the little effort needed to remind those around us of those things – inspiration can be infectious. Please read Caila’s incredible Encourage to Inspire post. 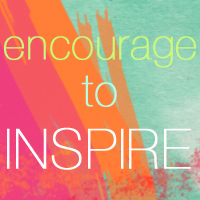 We are hoping we inspire you today to be encouraged and to encourage others around you. If you are looking for a quick way to encourage today, please consider joining our efforts to help children trapped in poverty by purchasing our Space Kid print. 100% of money raised from this print will be donated to Compassion International. You can purchase it in our SHOP or use paypal to send $8 to our paypal address at zac.jones (at) yahoo.com, leave a comment that you did and include your email address and I will email you a jpg. Thank you so much for spending some time here today! If you are inspired to start your own Encourage to Inspire project in your own life – leave a comment and tell me all about it! I’d love to hear from you! Falling for Friday and a PREVIEW! Hello!! 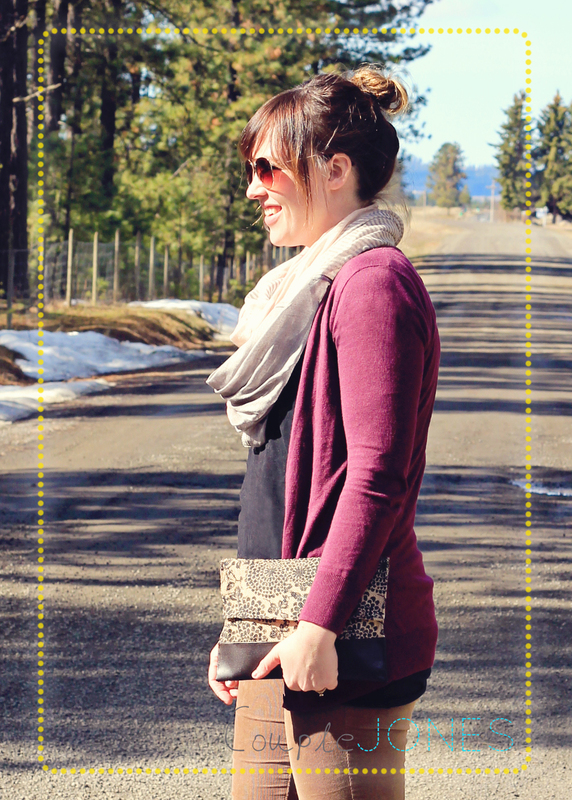 Today we are linking up with JustDawnelle and Kelly Westover for Falling for Friday! On Monday, we have an exciting collaboration with Cailamade to share!! This is my little sneak peak! I am SO excited to see what she comes up with. Caila has an AMAZING blog and I love everything she posts. I have known Caila since college and it’s been so exciting and inspiring to watch her start and grow Cailamade to what it is now. You guys have to check it out and follow if you haven’t already! Caila is a veteran in this blog world and has been kind enough to let me bounce ideas off of her as I try to figure out my way. One thing we always seem to come back to is the idea that we want so much to be real in how we write. To encourage our readers and inspire them to take on new challenges…not exactly as we present them, but in their own way. 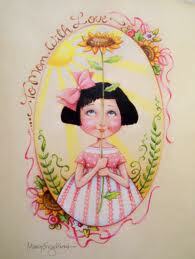 We hope that our blogs will be uplifting! So this is a peak at our collaboration : encourage to inspire. Encourage others around you in whatever way you can so that they will be uplifted and inspired to move forward on their own goals and dreams! Come back Monday to see what we have planned and stop by Caila’s blog today to see her exciting preview!! 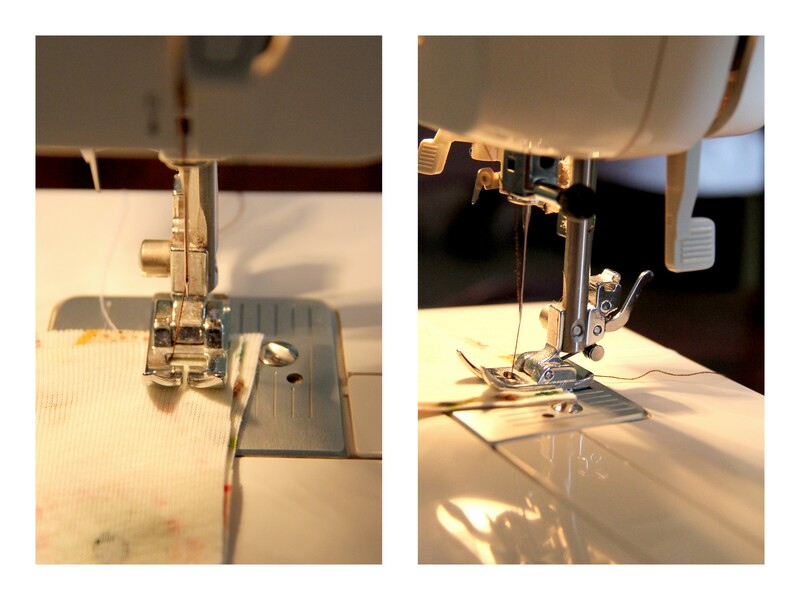 I have several friends who are learning to sew right now – and I LOVE it! 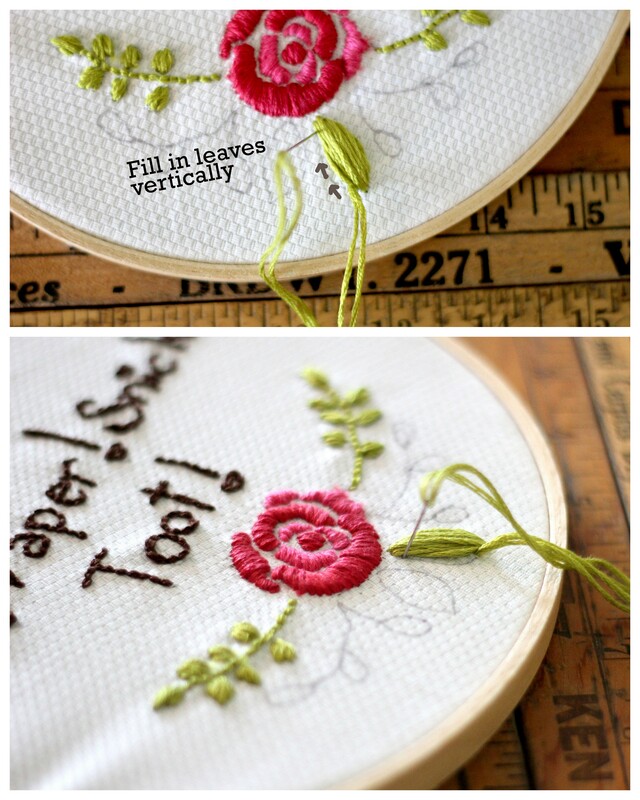 Sewing is such a fun skill to have, it opens so many possibilities creatively. My mom taught my sister and I and a bunch of my friends to sew when I was in the 5th grade. She ran a little sewing school in our basement as a way to make a little extra money as a stay at home mom. My sister and I still talk about the culottes we strutted proudly in the fashion shows we had at the end of each sewing session. I made a nautical themed vest and culotte matched set once…yeah…and THEN I wore it to Jr High. I was SO cool. If only the other 6th graders would have realized it. Through the years I’ve been so thankful for the skills I learned back then and I’d love the chance to be able to help someone else learn. OK, First, you will need a half a yard of a basic cotton fabric. Don’t go fancy with your first few projects. Stay away from knit. Once you get these skills down and are more confident then you can go for it with whatever fabric you feel up to trying – but for now – let’s stick to the basics. 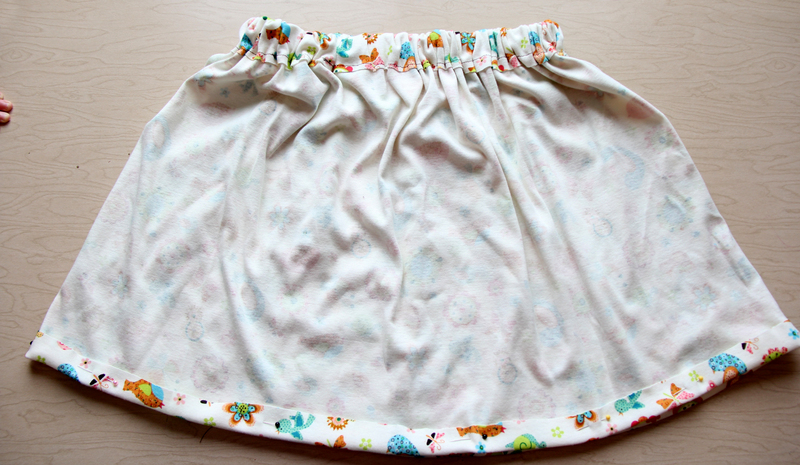 Because this is a child’s pattern, you should have enough length with a half a yard to go around the child’s waist completely with enough to have some gather. 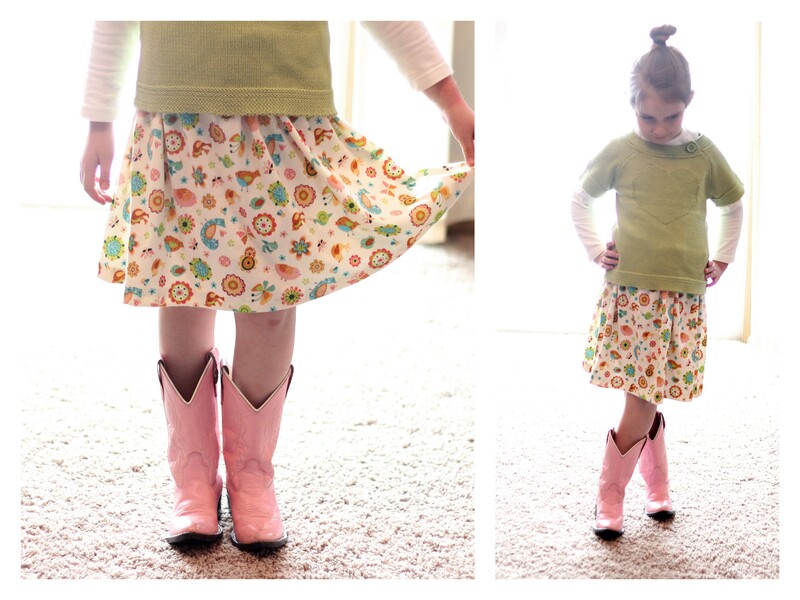 The smaller the child, the more full the skirt will be. You will need a yard of elastic – I would recommend at least a half inch wide elastic so that your waistband will be less likely to roll. Also, scissors, straight pins, and thread. I will be using dark thread so you can easily see my seams but you should use thread that matches your fabric. Start by trimming the selvage edge off the sides of your fabric. This is the edge that has been treated so it won’t fray and usually it will have the brand info on it and sometimes it has little holes in it and is a different texture than the rest of the fabric. So we want to get rid of those suckers. 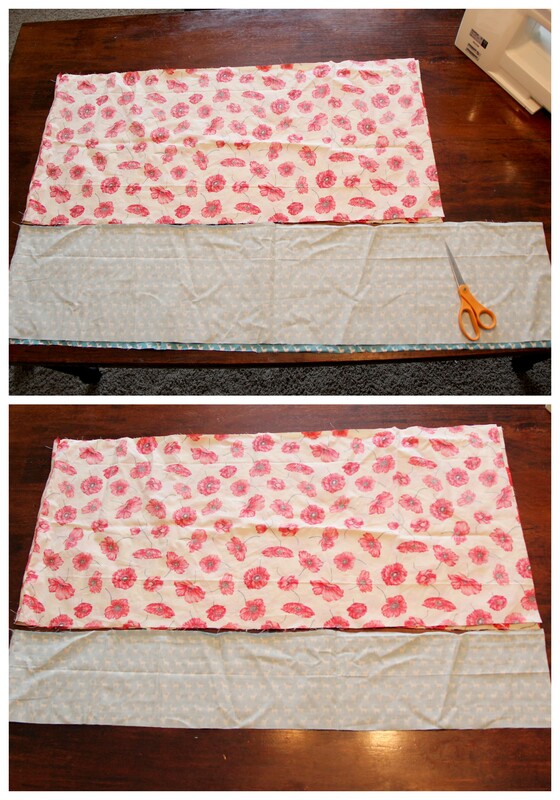 Next, fold your fabric in half as shown below, with the inside out. 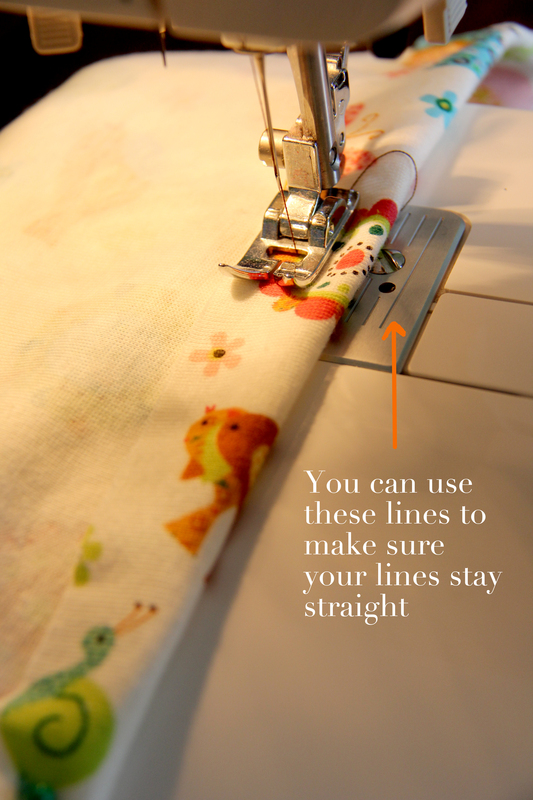 A few things to make sure you know before sewing the first seam. You should use a straight stitch for your first few projects, until you get the hang of it or are directed otherwise by your pattern. 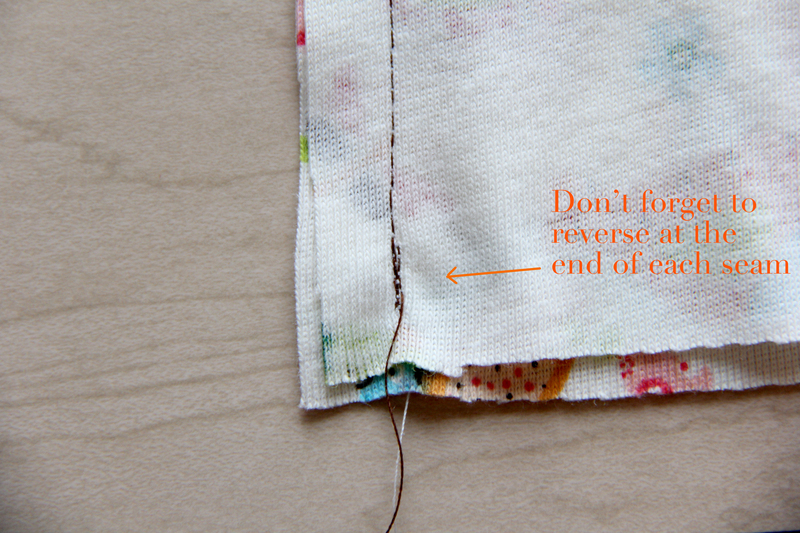 AND every time you start or end a seam, you should reverse a stitch or two and then continue on your way. This makes it so the seam won’t unravel. 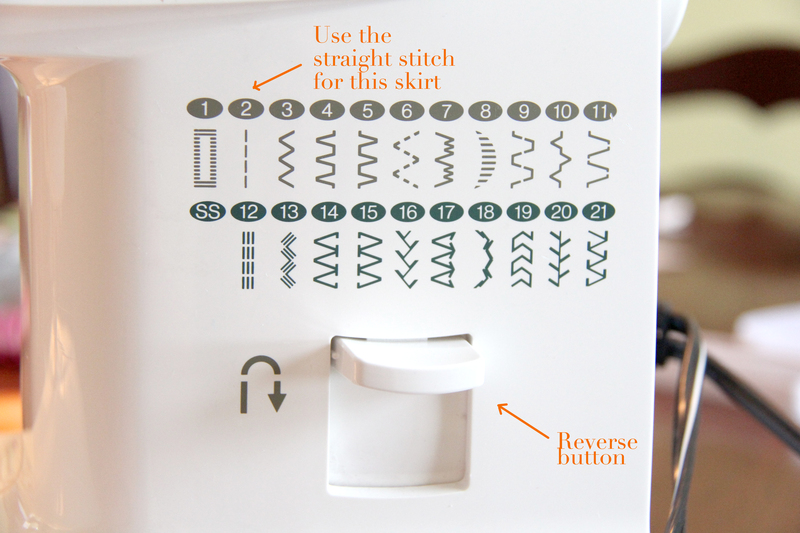 Again, there are exceptions to this rule later on in sewing but for beginners, it’s a good practice. Always make sure your presser foot is down before you start the machine. 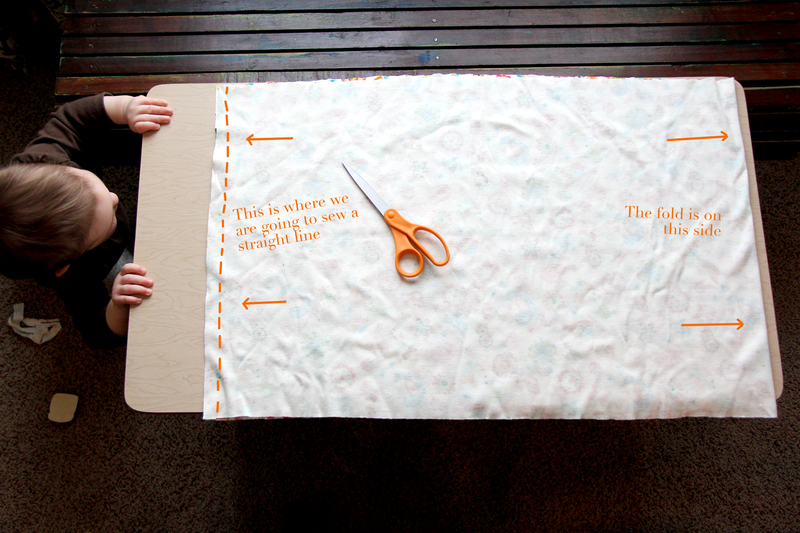 Sew a straight line on the side of the fabric that is opposite and parallel from the fold. 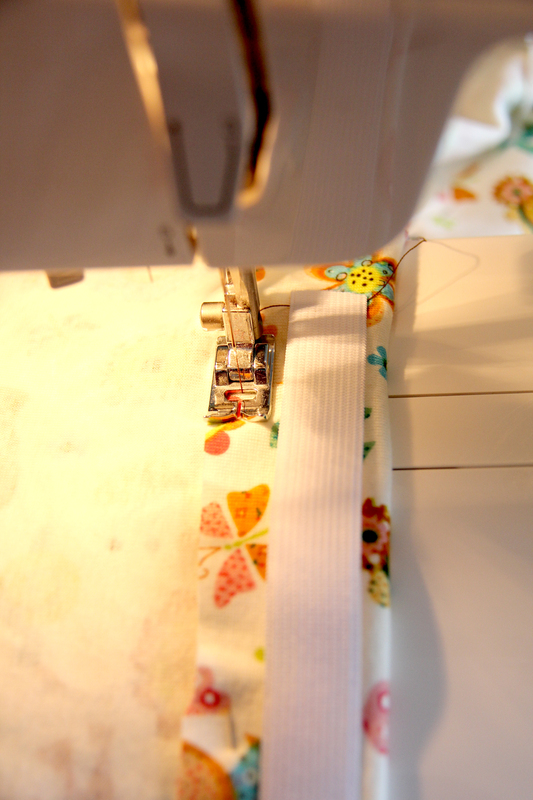 You want to sew at least a half inch away from the edge so that you give yourself a little space to work with. Next, fold over the top of the fabric circle in a fold wide enough to encompass the width of your elastic with a little wiggle room. 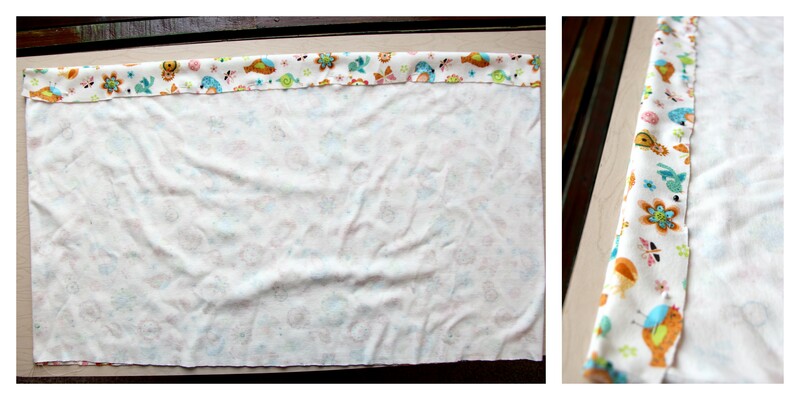 Pin in place – make sure you only pin the fold to the first level of fabric and not completely through both layers. I laid my elastic on top of the fabric so that you can see below that I made my fold wide enough to fit the elastic as well as give myself enough room for my seam. 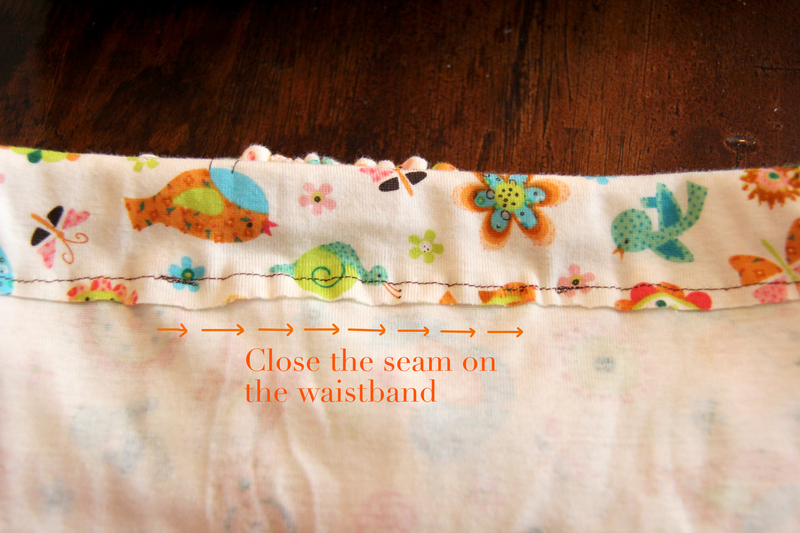 Sew along this line, but do not close the seam completely around the waist. 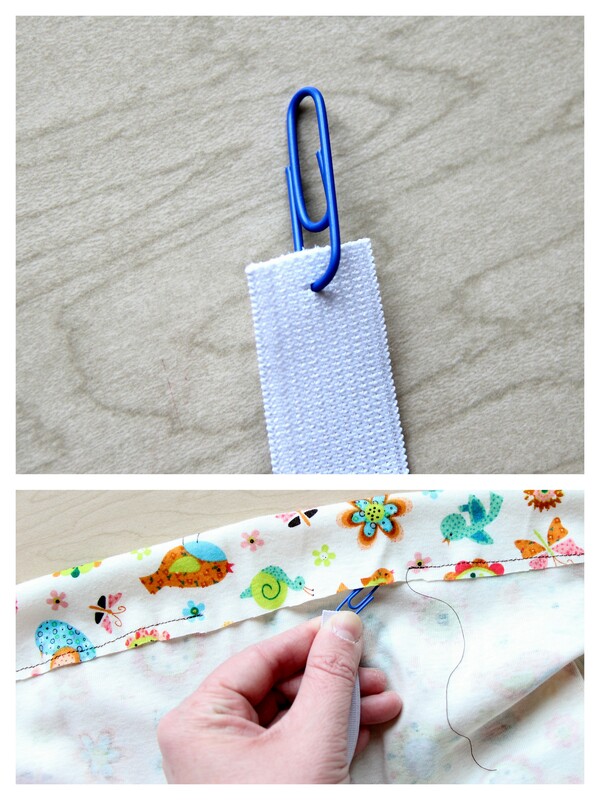 Leave about a 3-4 inch opening so that you can slide the elastic into the waistband. 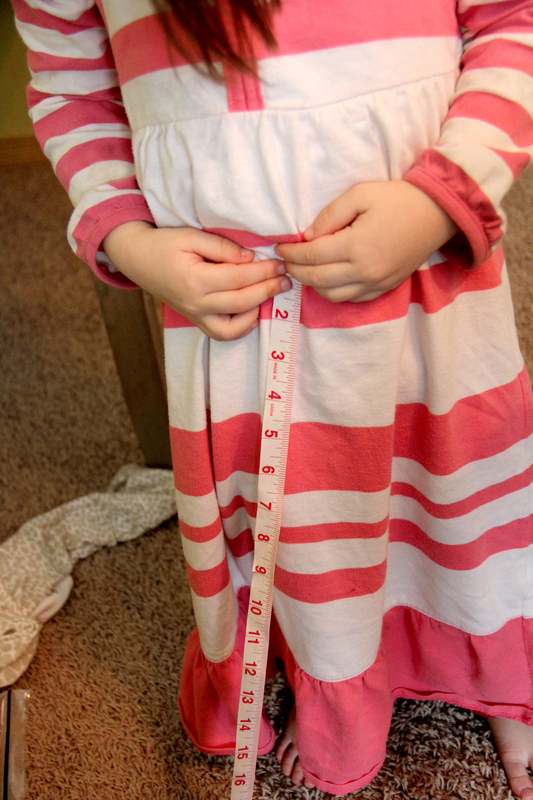 Now you should measure the waist of the child you are sewing for and cut your elastic to size, adding a half inch extra so that you have room to stitch the two ends together. This is a trick I use to thread my elastic through – USUALLY I use a safety pin, but I couldn’t find one and had to use a paper clip instead. Not as “official” but whatever works. Use the safety pin to thread your elastic through…make sure you don’t let the other end of the elastic to slip into the waist band. 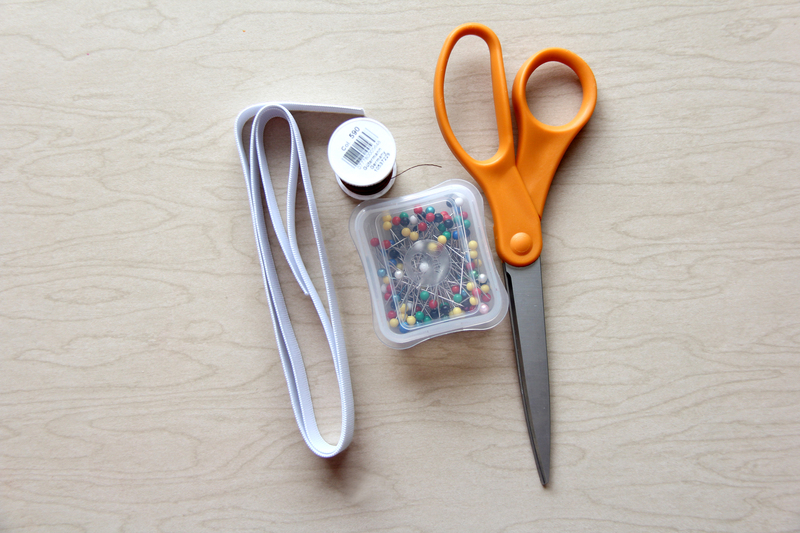 Hold it or pin it to the fabric so that you can sew the edges together when you are done threading the elastic. Be careful that you don’t allow the elastic to twist as you thread it. Once you get the elastic through as shown below, pin both edges together so that they lay flat. 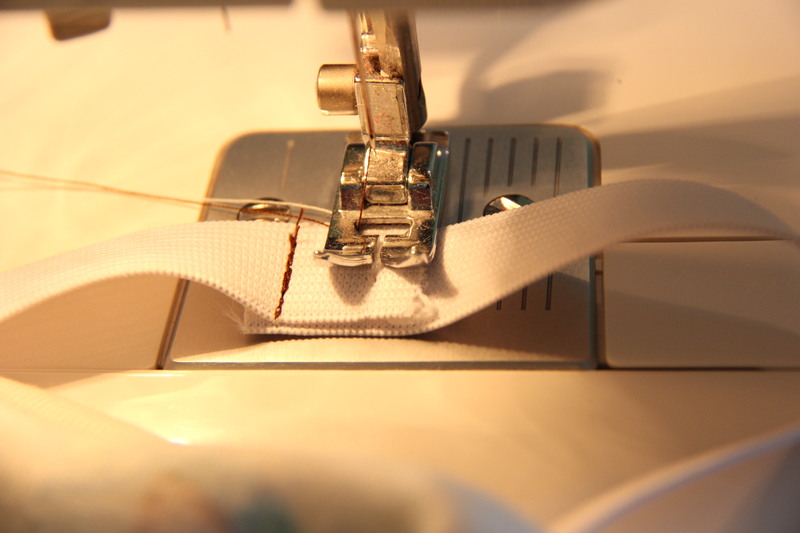 Pull the elastic clear of the fabric and stitch a line on each edge of the elastic so the extra doesn’t flap up. Now close the gap that you left open for the elastic. 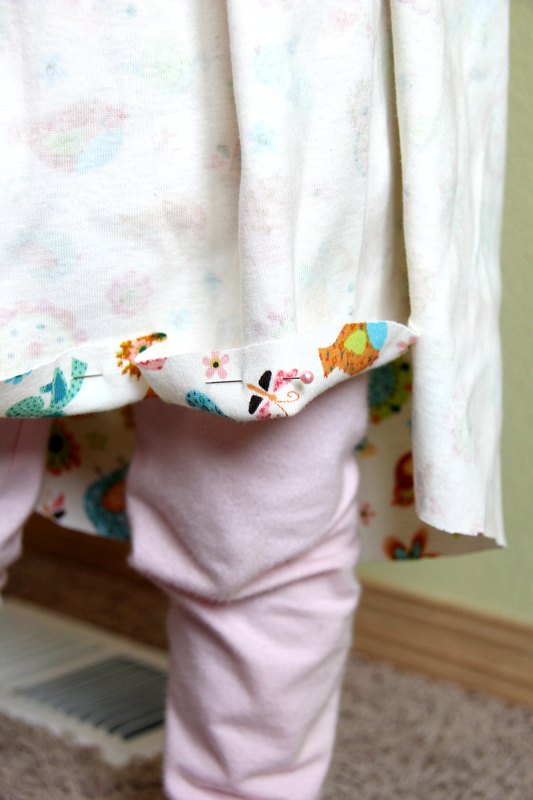 You should now try the skirt on the child…I can’t tell you how many times I try to eyeball things because it’s a pain to try clothes on kids, and whatever I am working on ends up weird. It’s better to actually see it on and see how it hangs so that you know for sure what length you want it to be. 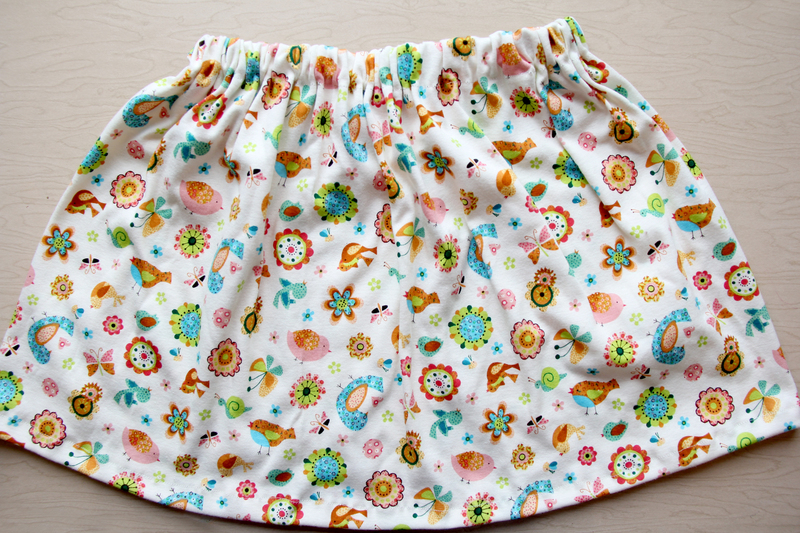 Leave the skirt inside out so that you can just fold up and pin one pin at the length that you want the skirt to be when finished. 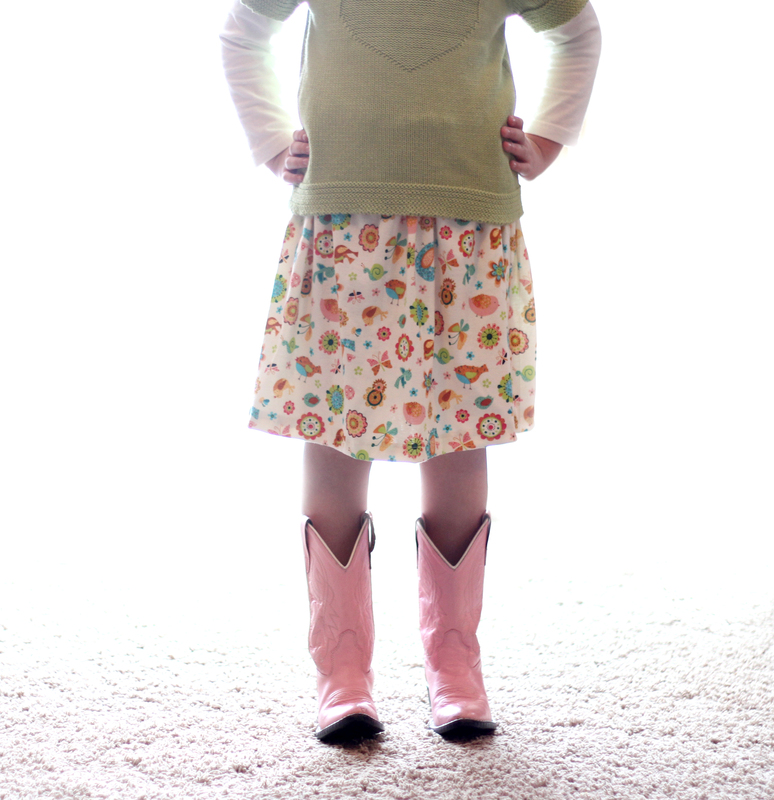 Don’t try to pin more than that when the child is wearing the skirt. Pins & kids do not go together. Once you have the length figured out, take the skirt off and pin it the whole way around the hem. It might be helpful to iron your fold at this point so that the fabric lays flat. Your skirt is finished! Way to go! Once you get this style mastered, you can add ruffles or color blocking to the hem or use more adventurous fabric, whatever you want. I hope this tutorial helps – if you have questions, feel free to leave them in the comments and I will help as I can. Have fun! UPDATE: Welcome to our visitors from BonBon Break! We are so happy to have you! I hope you enjoy this article! If you’d like to keep in touch, we’d love it so much if you followed our blog or find us on Facebook and Twitter . We love new friends! Several years ago, we moved from our first teeny little house. For a little over 3 months after, we had to rent while we waited for our new home to be built. We wanted to save as much money as possible so we rented a one bedroom apartment – it was us and our two year old and as much stuff as wouldn’t fit in our cheap storage unit squeezed into a VERY small space and the sewing machine did not make the cut. So I decided to try embroidery for the first time. Our kids are hilarious (in our humble opinion) and I’ve been trying to find fun ways to memorialize the funny things they say. My Middlest came up with a JEWEL a few weeks ago that STILL makes me laugh when I think about it…and so I thought “embroider it”, OBVIOUSLY- duh. Sorry if the word “toot” is offensive. I think it’s hilarious. My Oldest was teaching the Middlest to play “Rock, paper, scissors, shoot” and our middle girl got so excited to be playing that she got a little mixed up and yelled “Rock! Paper! Snickers! Toot!” and HILARITY ensued. Ha! 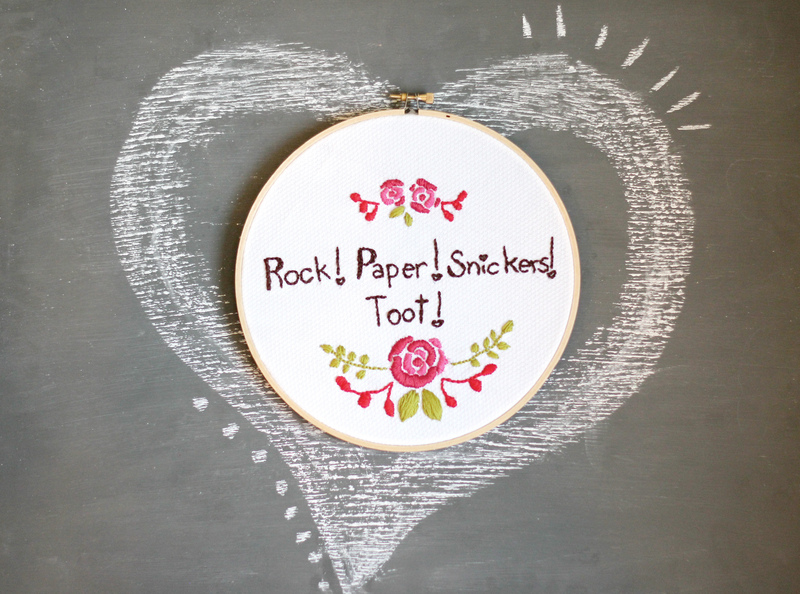 If you don’t have kids around to say funny things, you can also use your favorite song lyrics or quotes. 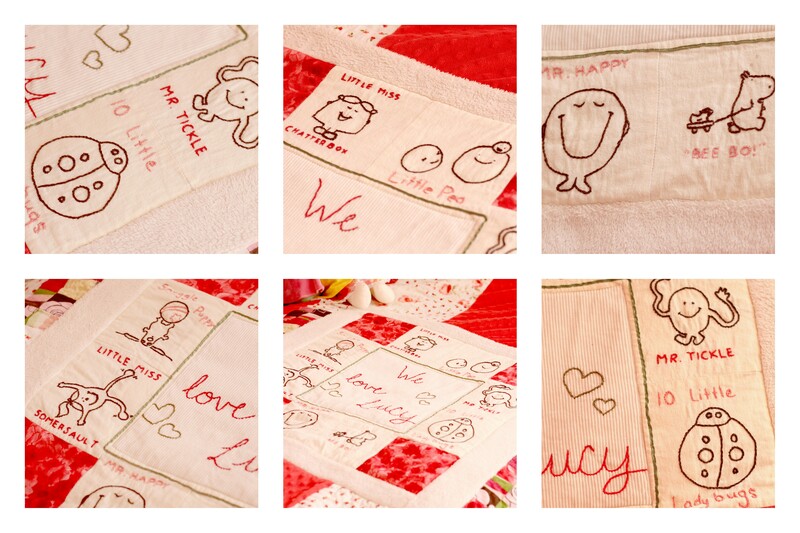 These are detail pictures of the quilt I was working on when we were in that little apartment. I drew some of our daughter’s favorite book characters and then embroidered them and used them as quilt squares for her big girl quilt when we moved her from her crib. It is so fun, I am so glad I tried it! This is a really easy thing to pick up and try so I am including some close ups of the stitches I used on these two pieces. I also am giving away the light bulb pattern for free in case anyone wants to use it. Click over to our SHOP to download the Pdf and then simply place your fabric over the print out and trace. This would be an easy pattern for a child to try out as well if anyone has elementary aged kiddos who are interested in learning to sew. When I was in Elementary School and Jr High, we always had to cover our school books. Did you do that too? I LOVED it. I loved covering the boring design of my math books or history books with a more BEAUTIFUL design…my favorites were Lisa Frank and Mary Engelbert…did you love those too? Chances are, if you were a child of the late 80’s – early 90’s, you did. Who doesn’t love fluorescent unicorns? I think my past love of book covers is what prompted me to make my own case for the new Kindle Zac got me for Christmas. (AWESOME HUSBAND!!) 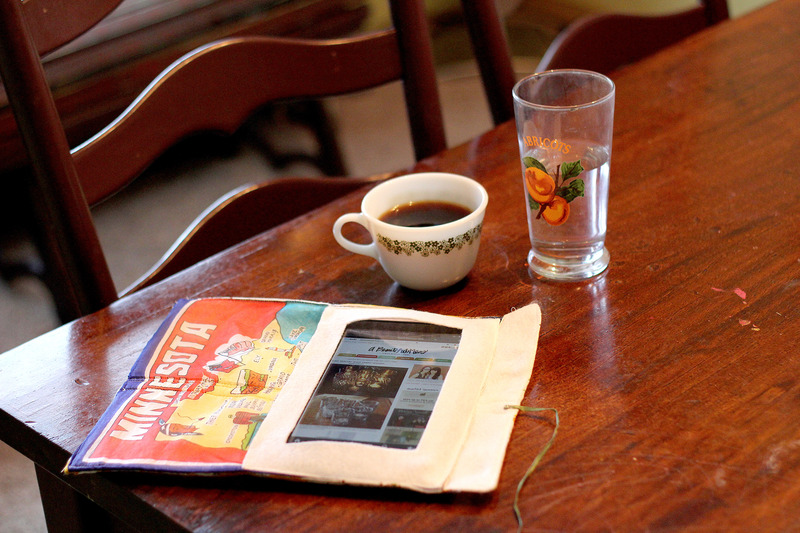 I love my Kindle…it’s such a fun new toy! It plays music too – I’m in heaven. Books and music all at easy reach – did I mention cartoons for when I’m at the dr’s office with my three crazy talkative girls? Yes! Ok. So this awesomeness was floating around with no cover and instead of buying one that was pretty sterile and tech-y looking I decided to personalize it a bit. I started with some felt cut to a size that would wrap around the Kindle…I had every intention of getting this started real quick-like while my girls were watching a cartoon…sadly it was too close to that crazy hour we call dinnertime and the baby was NOT digging my decision. That’s her “fit stance”…sprawled on the floor, screaming. So while holding the baby and talking to my middlest about how dinner was ALMOST ready and how No, she could not have ANOTHER apple because dinner was ALMOST ready, I trimmed the felt to the right size. I used two vintage handkerchiefs I got at a garage sale this summer. I sewed them around the felt like you would a pillow case, back to back and leaving a small opening to flip the square inside out after seaming… (oh and I definitely used my seam ripper because I was going too quickly and sewed the thing the wrong direction). Then when they were right side out, I sewed around the outside again so that the square would stay crisp. 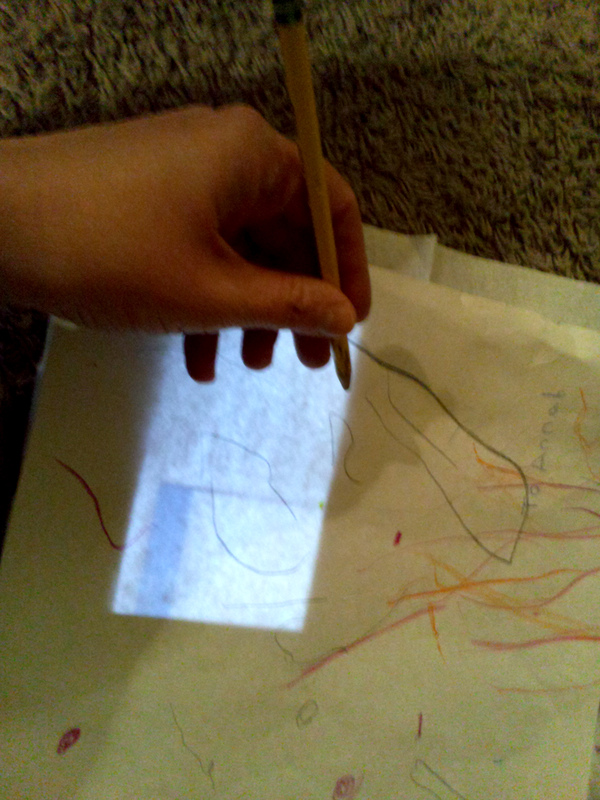 I used a piece of paper over the lit up Kindle to trace the size of the screen so that I could cut a hole through the felt that would allow me to read while the Kindle was still in it’s case. Don’t push very hard with your pencil- just barely line the screen, too much pressure could damage it I think. Then I cut a square out of felt that would hold the Kindle inside it’s case and used the traced and cut out square of paper to cut out the center of the square for reading. I sewed that square to the inside of the envelope. I forgot to document that process but it’s pretty straightforward. 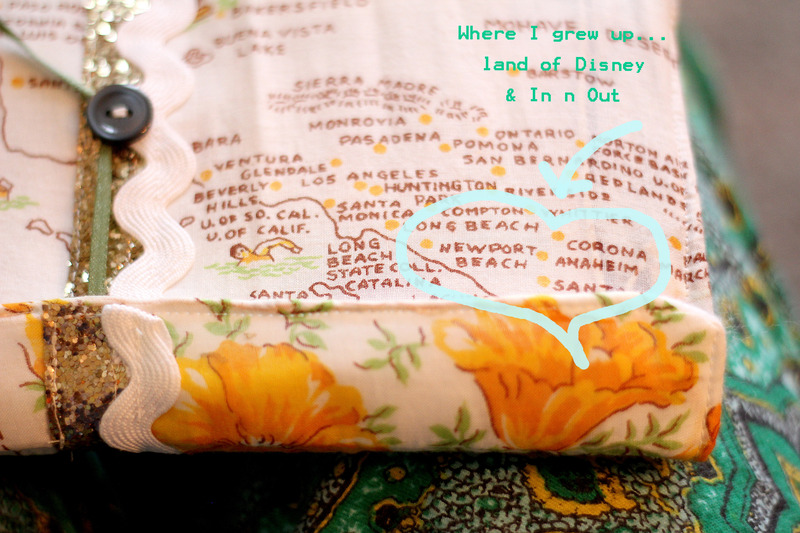 I snagged these handkerchiefs because I have family in both states and they are important places to me. I had some left over glitter ribbon from the Sparkle Skirt I made for my middlest girl’s birthday and some white trim left over from her quilt that I added just for fun. To keep the envelope closed, I hand stitched a button to one side and a long ribbon to the other side, when the envelope is closed you can wind the ribbon around the button and it stays closed perfectly. I LOVE avoiding working on things like snaps and buttonholes ;) The easier and quicker, the better! I love the way this turned out. It’s a little quirky but that makes sense. :) I know I could have gone out and bought a case, but this was more fun. And practically, the thick fabric will be a pretty good defense from all the fluids and sticky fingers flying around in my life right now…spilled drinks, etc. It seems like glitter and sequins are everywhere this year…or maybe it’s just that after so many years of being surrounded by princesses and sparkles and glitter from our girls, I’ve finally succumbed to a love of glitter. I am most inspired by glitter that’s combined with a little bit of messiness and rawness. I like the juxtaposition of two different kinds of styles and textiles. 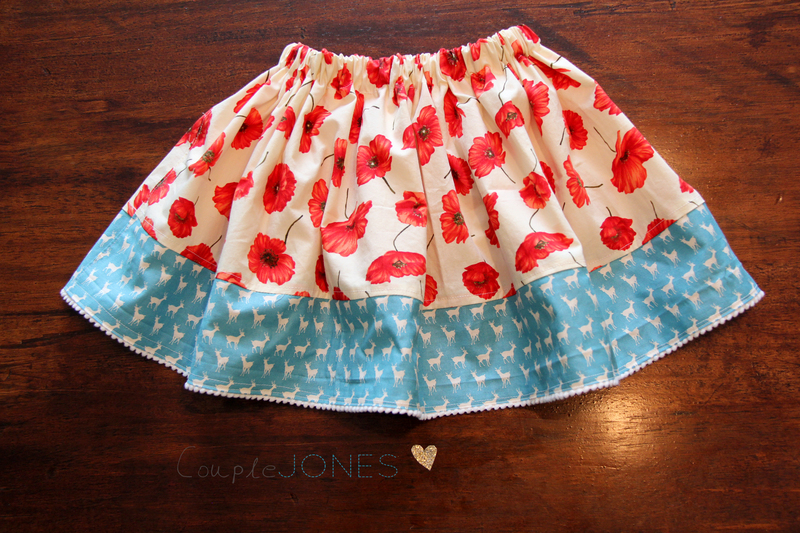 I made this skirt for my middle girlie’s birthday this year and it ended up being perfect for Christmas and New Year’s as well. I used 2 yards of Tulle so the skirt has a LOT of bounce and fluff which she LOVES. Then I layered Taffeta and a sheer fabric with sparkles on it for the body of the skirt. I did a simple skirt, just sewed the ends to my fabrics together to make a circle and then stitched a fold in the top to pull elastic through. I got too into the project and didn’t take photos of my process but you can find all kind of easy skirt tutorials on Pinterest. The real awesomeness of this skirt is in the details. I also added a strip of glitter ribbon to the bottom of the taffeta layer…I’m kind of addicted to this ribbon. I’ve made headbands for the girls, I’ve used it to design some custom invites for a friend, I’m still scheming on ways to use it because it’s gorgeous. I found it at Joann’s. Glitter just makes us happy.